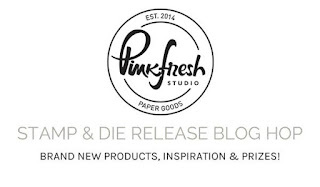 I'm so excited for my first Pinkfresh Studio blog hop! You should have arrived here from the wonderful Julia Stainton's blog! 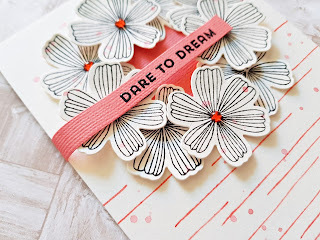 I love everything Pinkfresh Studio makes and the stamps and dies in this release are no different! There's so many to choose from, I'm sure you'll find something you love too! I'll share 6 cards today because, well, I created a lot as soon as I got my DT package - I wanted to try everything right away (didn't manage)! All finished cards are 4.25x5.5" top folding cards. On the first one I used a couple of different sets. 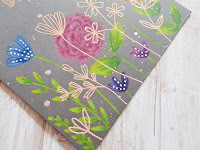 The background I created with a foliage stamp from the Bird with Flowers set. I just stamped the image multiple times starting at varying heights so that the background looks more random. The flowers are a part of the Fleur 1 set. I stamped a few on watercolor paper, die cut them using the coordinating die set and used some of my Distress Markers to add color. The Believe sentiment is from the Word Series: Believe stamp and die set. I stamped this with embossing ink on blue card stock and embossed it with white embossing powder. All new sets are now available online at Pinkfresh Studio, so be sure to check them out! 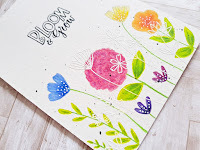 On this second card I used a bigger flower stamp from the same Fleur 1 set. I left these black and white and die cut them using the coordinating dies. The strips I stamped using a stem stamp from the Bird with Flowers set. The sentiment is from the Word Series: Dream set; I embossed this with black embossing powder. One of my favorite cards must be this one, because I just love this blue! I didn't think of it at the time, but in retrospect it reminds me of the Indigo Hills collection! 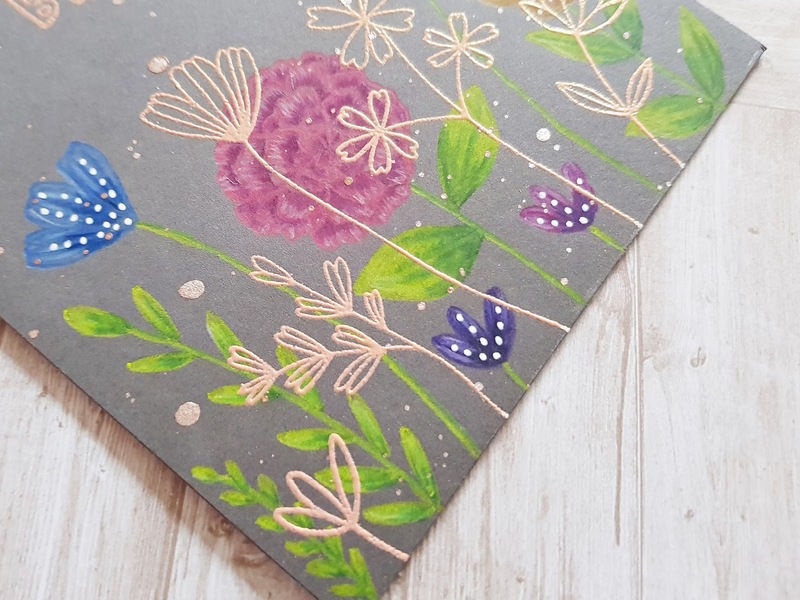 I used several stamps from the Fleur 1 set, I arranged them on my stamp platform and stamped them in two corners of my card. I then colored these in with my blue Distress Marker. The sentiment is from the Tealightful Day set and I used the same blue Distress Marker to color the stamp. I wanted to stamp the same image on different color card stock and color them in with my color pencils (a mix of Prismacolor and Polychromos) to see what they look on different backgrounds. My boyfriend likes the dark background - normally he doesn't care about my work, but he actually mentioned he likes that, ha! So first I used a light grey ink pad to stamp a variety of flowers I arranged on my stamp platform. These flowers are all from the Fleur 2 set. I then colored these, and to add some interest I stamped a second layer of flowers on top, this time using only embossing powder. 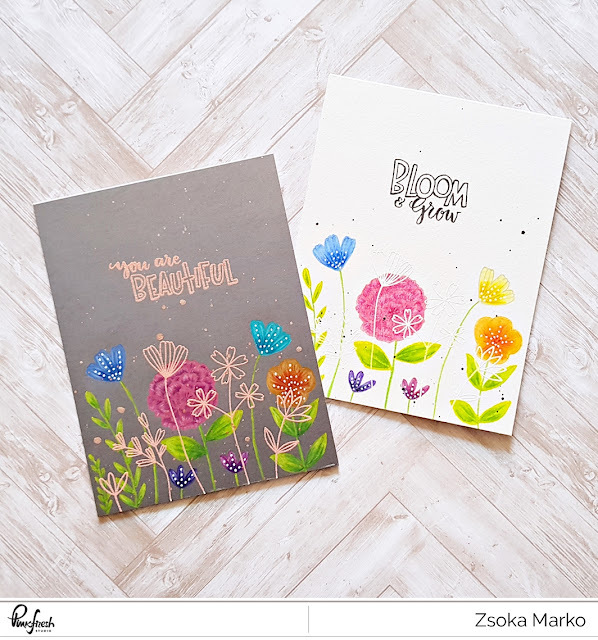 Both sentiments are from the Bloom & Grow set. 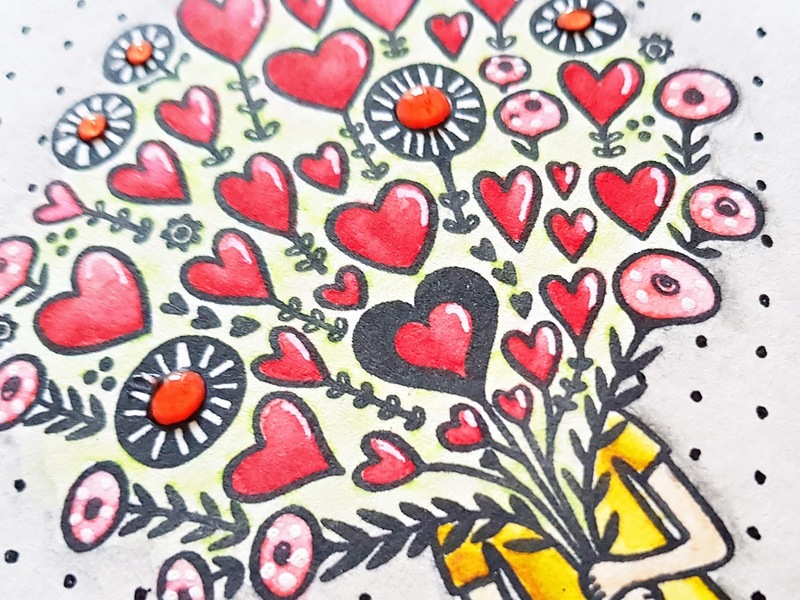 On the last card I am sharing today I used the wonderful Bouquet of Hearts stamp set. I just love this image so much! I stamped it on watercolor paper using black ink, then colored it using watercolors. The sentiment is also from this set. At this point it was all too white for me (if you know my scrapbook layouts, you know I have a problem with white :D), so I added polka dots to the background using a black marker. To be eligible, leave a comment on each blog post in this loop! Comments close at 11.59pm CST on Thursday, February 8th, 2018. 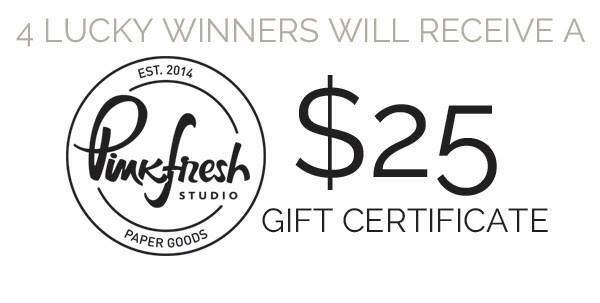 The winner will be randomly selected and announced on Saturday, February 10th, 2018. Your next stop is the amazing Erum Tasneem! I am such a huge fan of her work!!! Even my boyfriend says she does amazing stuff and he really doesn't care about papercrafting :D.
8. Zsoka Marko ------> YOU ARE HERE! I super LOVE your gorgeous style! Each of these cards is so unique and beautiful! 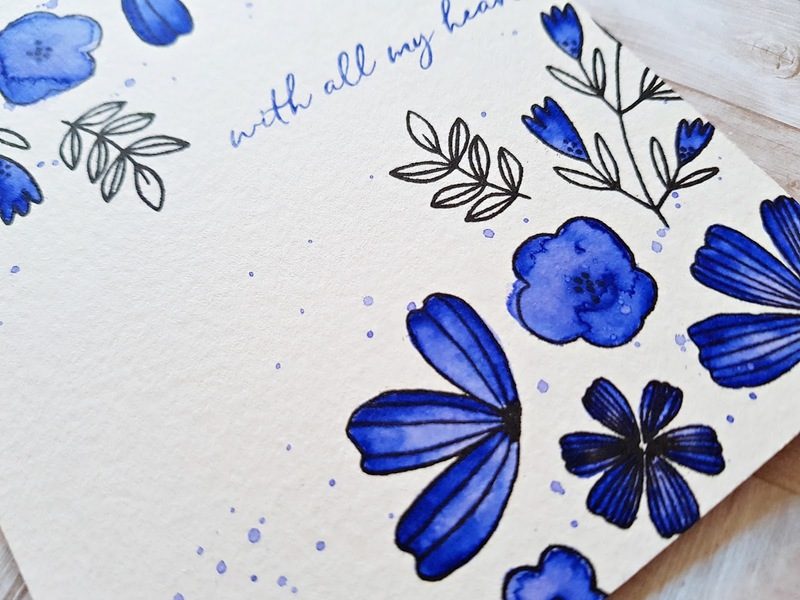 I love the blue color scheme... but then I also adore the Bloom and Grow and You Are Beautiful cards... You are so talented. these are amazing, so glad I discovered you!! love your work! Fabulous cards!!! I think they're all fantastic, but I especially love the last one! Your addition of the polka dots in the background looks awesome!! Really makes the focal image pop!!! What a fun release!!! 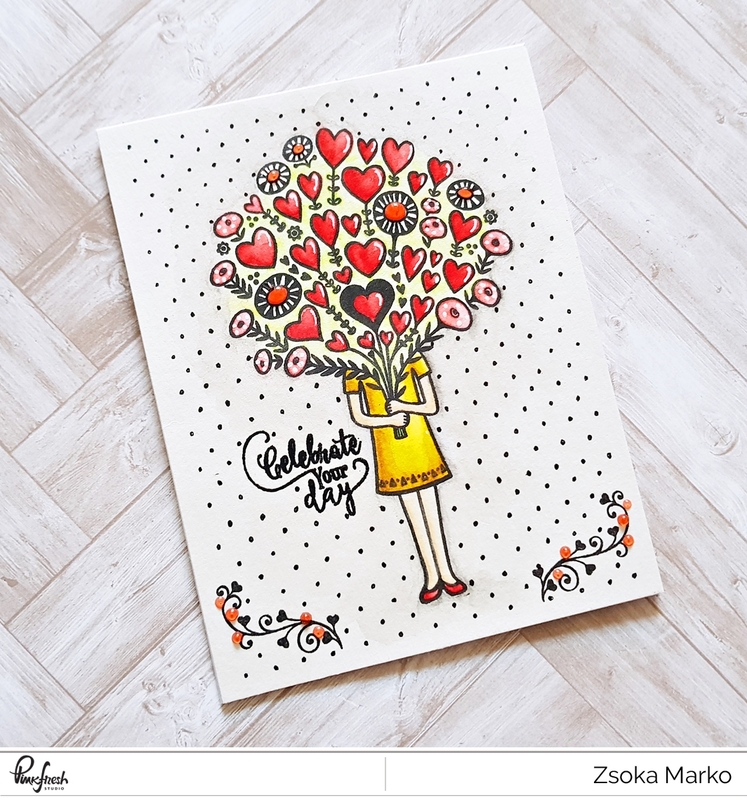 I adore the sketched style of the images and the sweet sentiments in these new sets!!! Thank you so much for your kind words! Making cards is pretty new to me, these are my first where I don't use patterned paper, so I am really happy for all the positive feedback! Thank you! So country looking.. and different. I love love love them! I love all your cards! So cute! Wow! I love those colors in your cards. I'm loving this entire release. Beautiful cards!!! Those images are amazing!! I just love this release!!! Stunning! All have something so unique that I love. 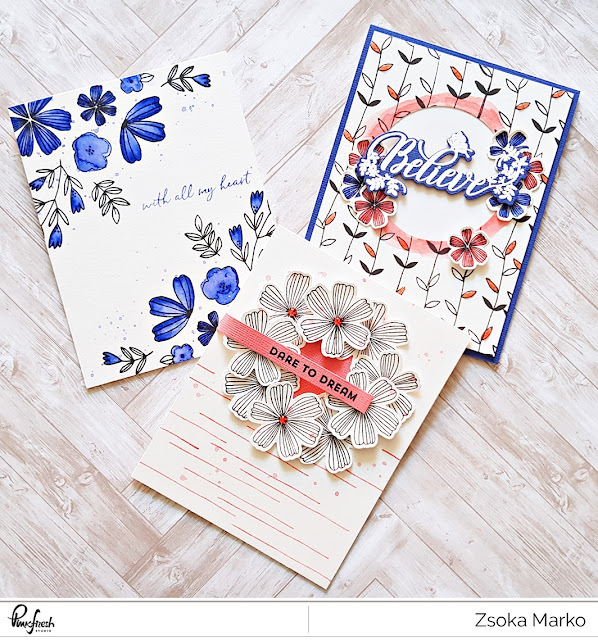 Simply love your style in card making! You have a great talent with color and combination! I do not have a favorite because they all were the best of show! These are so stunning ! 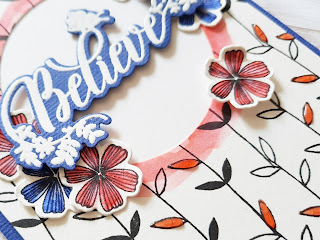 I like the background you made on the first card and the word BELIEVE is so pretty ! The wreath of flowers on the 2nd card is so beautiful and I like the colors you picked. And I also love the embossed flower images on top of the colored images on the 4th and 5th card. Super job ! TFS. wanted to play with this collection as soon as you rcv'd it. 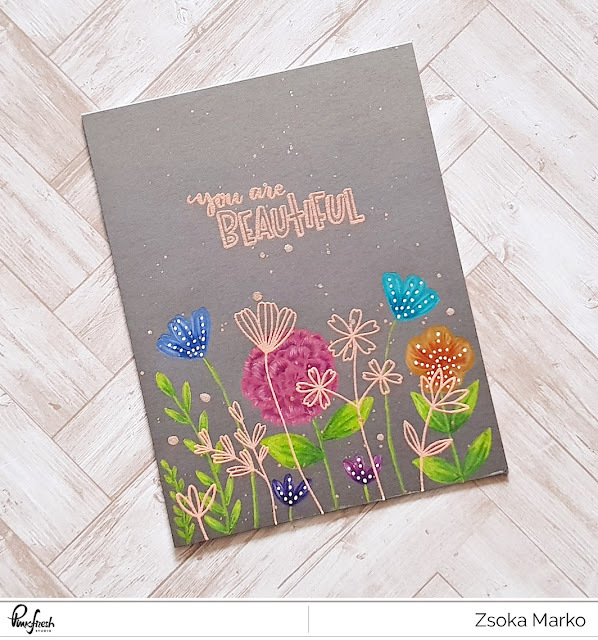 Looks like you had a great time, your cards are all so beautiful, love those tiny dots you made as a background I had to double check as I was convinced it was patterned paper. Love the white card base with the pops of color. Nice showcasing of the stamps. I like the pretty floral cards you created. Thank you! Yes, simple is new (and a challenge!) for me. Very different from what I do in scrapbooking! Love, love your cards and all of colors. Thank you for sharing. Wow, all these cards are soooo beautiful! I love the blues and coral colors, so pretty and fresh! 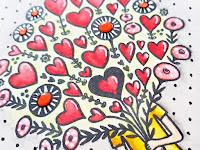 The Bouquet of Hearts is one of my faves and the colored pencil flowers are amazing, I especially love the one on colored card stock. Thank you! Yes, those pencils look a lot more vibrant on a dark card stock! Your designs make me smile!!!! Gorgeous cards! Love your beautiful coloring and details! So many fabulous stamps and dies.... my list is long! Love the Fleur 1 & 2 sets! Such an amazing array of cards. You've done such a wonderful job showing off these new stamps. Beautiful cards! Beautiful cards! I love all of them—especially the one with the blue flowers! Thanks for all of these great ideas! I just love your cards! 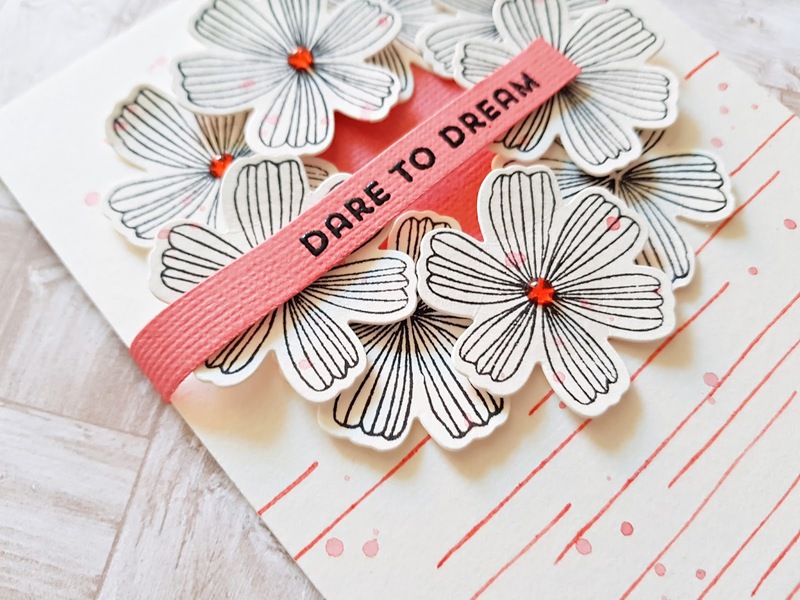 I love the black and white look of the "Dare to dream" card and those blue flowers are beautiful! Thanks for sharing! The flowers are all so light and delicate. The coloring adds to the airy feel. Oh my goodness! What beautiful cards! That royal blue color has me smitten! I love florals but they are difficult for me to find the right color combinations, you hit a home run! These are wonderful! So many good things! My favorites are that flower wreath and the blue floral one, just gorgeous! Wow you rocked these stamps!! 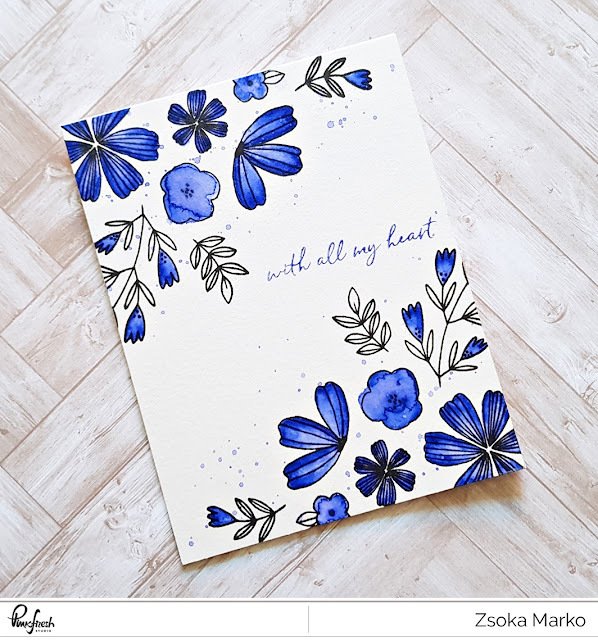 I absolutly love the blue floral card. 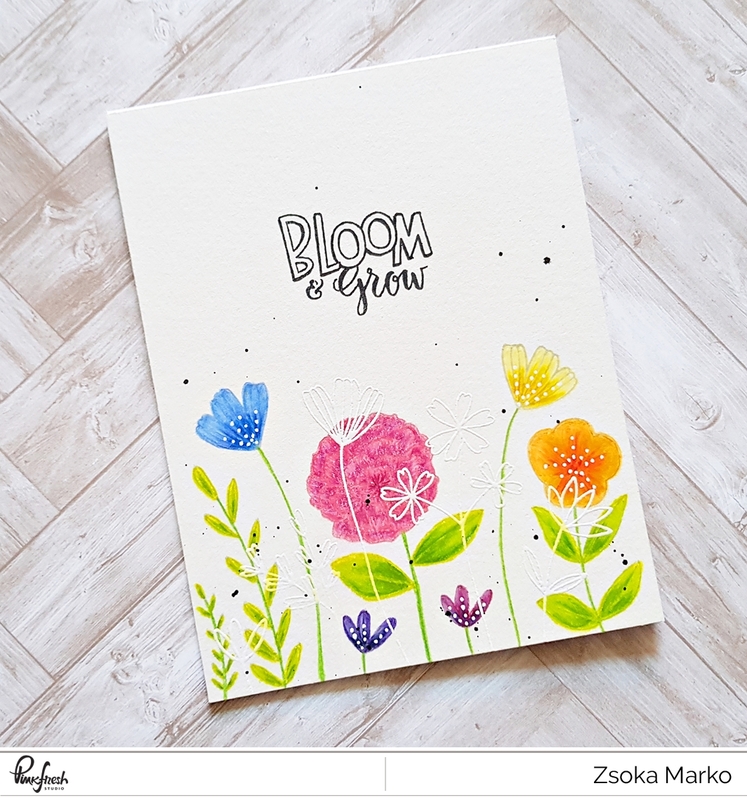 The black and white flowers with the lines you made out of a stem stamp - genious - love it!!! Really love the sets you have shown - putting them on my wishlist! Beautiful cards! Your cards are fantastic. Beautiful coloring. Love the flowers on the dark background. You knocked it out of the park with your projects!! Wow!! Your cards are fabulous!! Love this release!! All of these cards are gorgeous! I really love your style! Your cards are so pretty! I LOVE the beautiful look of the card with the grey background! So fresh and unique! WOW!! your cards are beyond stunning!! love, love, love!!! So much fabulous eye candy! These are all beautiful! your cards are my favorites on this hop, there are super beautiful!!! Wow! So much beauty in one place! Just love how you made the same card on two different colors of cardstock... Fantastic creations! You are so creative!!! Each card amazed me as I read your post. You rocked this release and I love and adore your Dare to Dream card. Thank you for the inspiration and for sharing your creativity!! 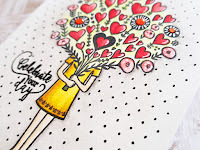 Those flower stamps are SO cute and I love the creative way you've displayed them!!! Spectacular work! Oooh, these are all so stunning! Fabulous cards! I absolutely love love love everything you do but am especially blown away by the gorgeous blue floral card and on your second card I love how you wrapped the sentiment round the side. These are stunning! Love the way the deep blue pops on some of these! Beautiful cards! I love the simplicity of the card stamps even though I know they weren't simple to make. The girl with flowers - can't believe you made all those dots but it's so cute! These are some really cute cards! Your samples are all so very creative. I love the graphic look of your first three cards. The bg's are fabulous. Loving the way your next two cards look so very different on the two cardstocks. Your heart balloon card is divine. Love the polka dots! You are so talented. Thanks for sharing. 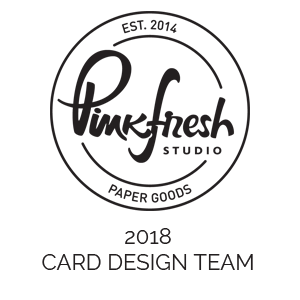 Your artistic style is a perfect match for Pink Fresh Studio images--your cards are just beautiful! Haha! Then I did my job well 🤣. Thanks so much for your kind words! 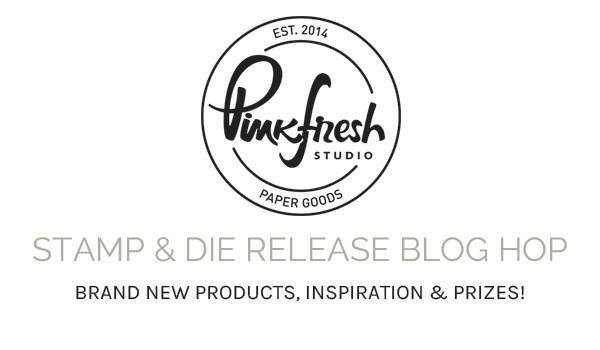 I follow a lot of stamp companies on instagram, but Pink Fresh Studios *really* outdid themselves with this release. Thank you for sharing so much of your inspiration with us. It'd be very hard for me to choose just one, but I love your white and blue floral combination. Your cards will surely make for happy mail to whoever receives them! I think PFS has a very different, unique style! Which I adore! I agree though, There's so much awesomeness in this release, I was squealing when I got my package! Thanks so much for your kind words! I really like these products and you displayed them beautifully. Looks like you were having fun! Oh my ! This is such a gorgeous set of cards ! Wow your cards are so awesome and I honestly thought those polka dots were a Stamp, love it! I absolutely love your cards! So many pretty creations. You must have a very steady hand and great eyesight to create the dot background... it's wonderful. Thanks for sharing the tip of 2nd layer stamping with just embossing powder. Great idea! You hand-dotted that background?!?! I'm so impressed. I realize that's like the least important thing about this post, but I can't believe you got everything so even! I think my favorite card is the "with all my heart" in blues. I just love a good monochrome, and that is a fantastic monochrome. So beautiful and delicate. Thank you for sharing all these different ideas; I love the variety you've come up with!